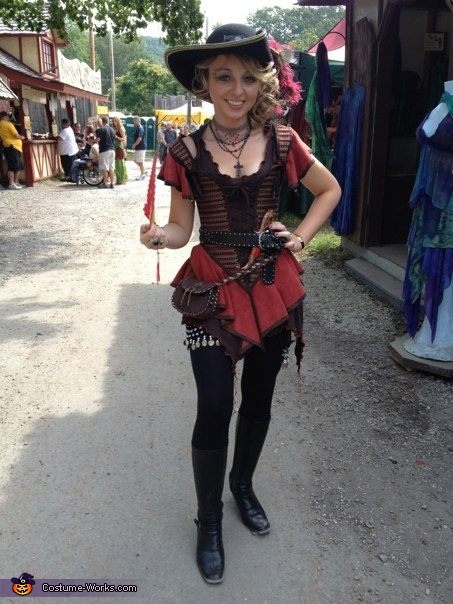 The women in the picture is me, I spend a year putting my vixen pirate costume together. Lots of research, money and time went into piecing this costume together. It all started in Aug 2011, my boyfriend and I went shopping at a local mall where he bought me a cross necklace (as seen in my picture), after being inspired by a local Renaissance faire. Slowly my costume started to come together, finally I had gathered everything except for the bodice. I came across a clothing store online, that was 2 hours away from my home. I had planned on getting a red/black bodice, sadly the store didn't have that in my size, but I still tried on a bodice just to get my size, turns out the bodice that I was trying on would be the one I would end up falling in love with. I put the bodice and matching shirt on hold and a week later it was home and hanging up in my closet. I finally had the costume complete, except for a pirate hat. Once again I researched and priced already made pirate hats. The ones I liked were way too expensive and wouldn't be ready in time for the faire. My lovely boyfreind found a black floppy hat and was kind enough to suprise me with it. Again lots of research went into making this had into the pirate hat of my dreams. The hat took over a month to put together, countless trips to the craft store and countless hours of molding and shaping the floppy hat into a proper pirate hat. Finally the hat was ready, and it was time to go to the faire. The reactions to my costume were pricless, alot of people were asking to take my picture, and alot of questions were asked on how I put the costume together, I was more than happy to answer all questions and to pose for pictures. my friends even decided to enter me in the costume contest. To my suprise, I won 1st place. It is safe to say that all my effort was beyond worth it. I hope all the viewers enjoy my costume just as much as I do. Ok, that looks great! I have the hat and will put together the pirate lady from the hat down! You look great!